“A cold wind was blowing from the north, and it made the trees rustle like living things.” George R.R. 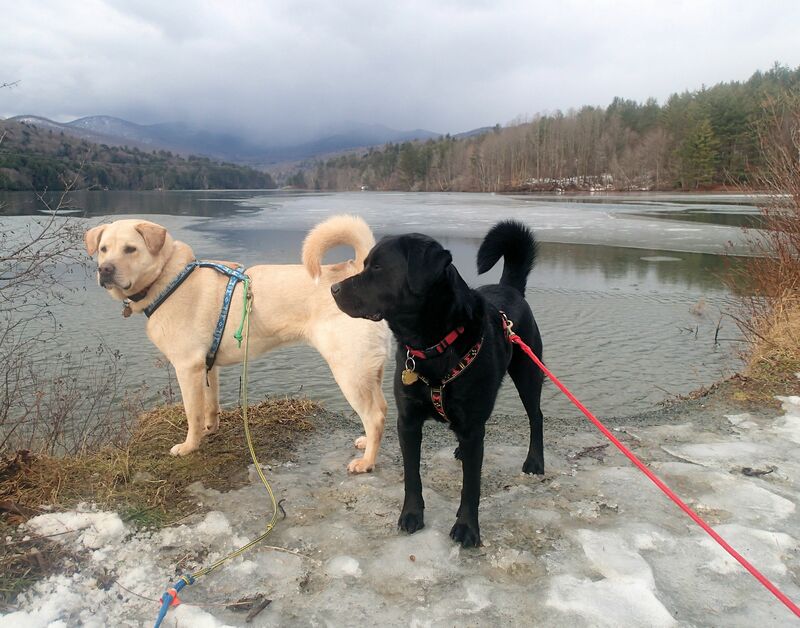 Martin | Vermont Paddle Pups! Oh, yes..the wind was howling today! 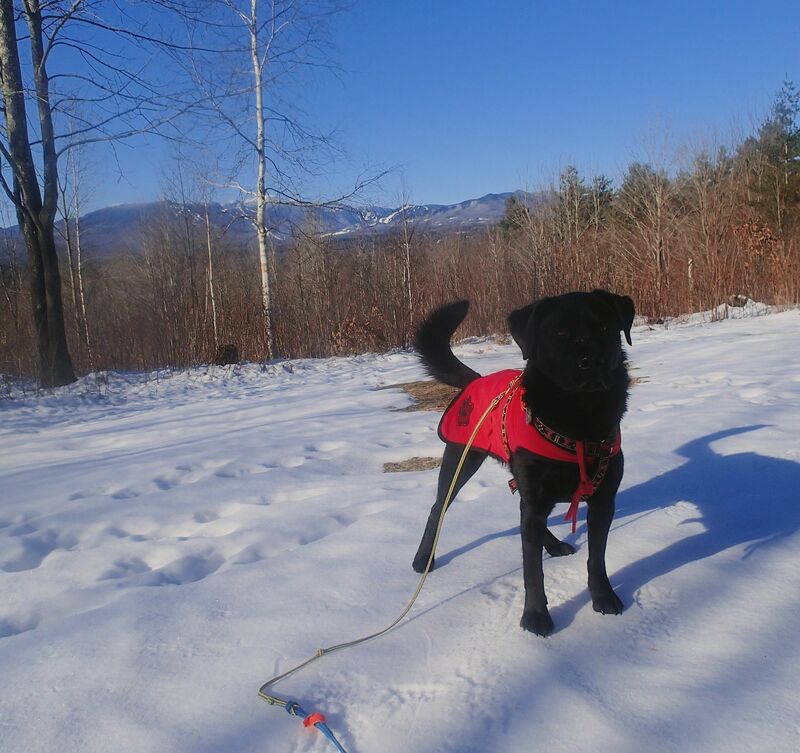 The past few weeks have seen temperatures fluctuate from 46 degrees (f), down to 10 below (f), and everything in between…living in Northern Vermont, we expect that bitter cold will greet us as the New Year arrives, and 2015 is living up to those expectations. A forecast of extreme wind chills means our outdoor activities may be limited for the next few days, but as long as we do not have the extended “polar vortex” periods of arctic cold that we had a year ago, we will be happy! 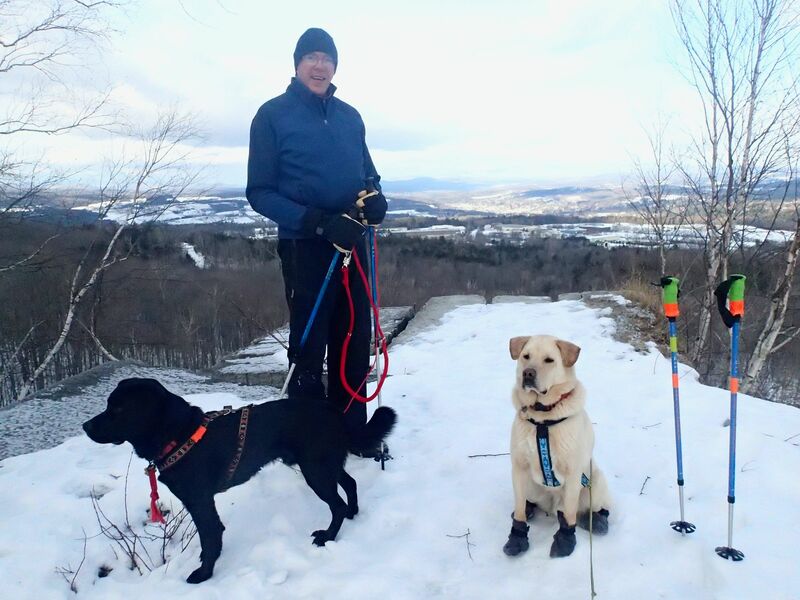 The last week of 2014 had us hiking in some rain, thawing temperatures and diminishing snow, and then a return to “parka and booties” conditions for the dogs. 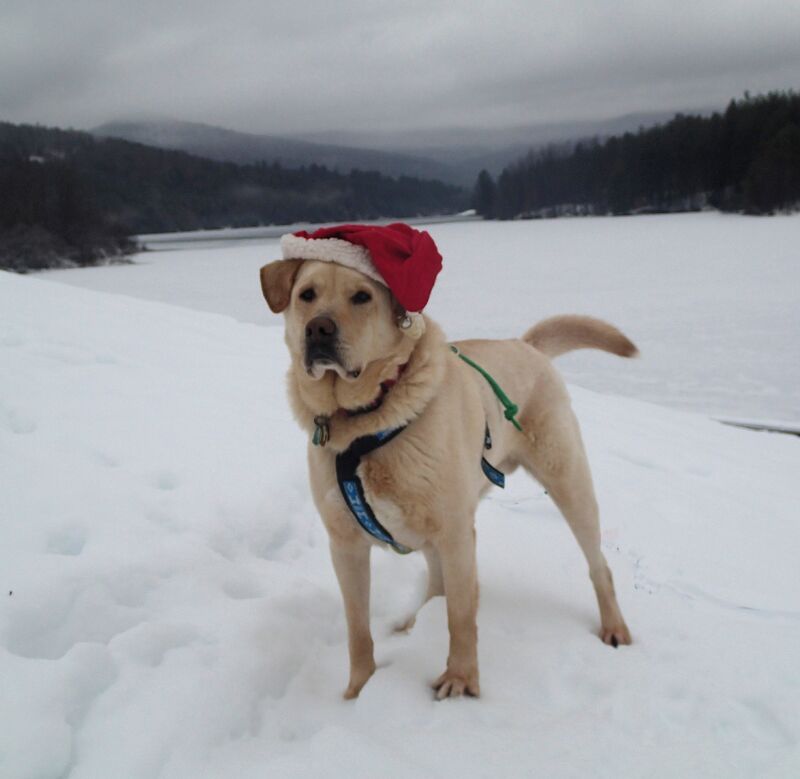 It was a bit drizzly, but we had to get a Christmas photo at the one of our canoeing spots, to post on the Friends of Waterbury Reservoir facebook page! It was a nice hike, though it nearly took a disastrous turn, through no fault of our own. While hiking back down the trail (actually, a closed road, so it is at least 25 -30 feet wide), on the right side of the trail, a back-country skier came flying past us, within arms reach to our right. No calling out “on your right”, or “coming through”…he just flew past us without any warning. Thankfully, none of us had taken a step to the right, or there may have been a terrible collision. It is probably a good thing he was long gone by the time we arrived back at the parking area, as my confronting him may not have been a peaceful event! There had been nearly no one else using the area, and I still have no idea why he elected to ski the narrow area between us and the trees on the right….crazy, and rude. We took advantage of the warmer temperatures, and lack of snow, to hike out for morning coffee on Elephant Rock….very peaceful, and no dead gulls on the rock during this trip! 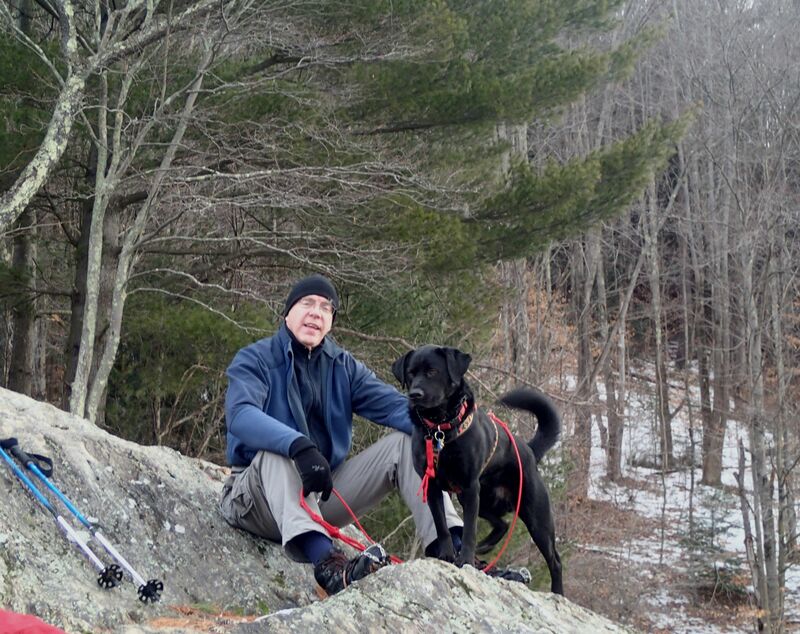 And of course, according to tradition, we took Gryphon for a nice hike on his 5th birthday….weather was again a bit sketchy, but we had a nice time at a local state park. 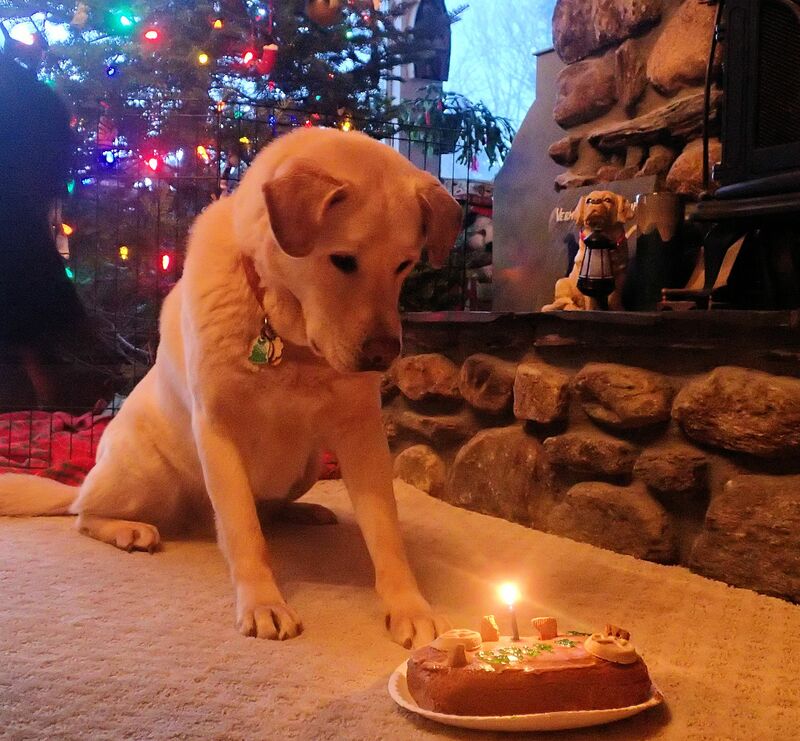 And yes, he got to eat his cake, too… a delicious concoction made with the dehydrated turkey food we won from the Honest Kitchen, cake mix, peanut butter, and topped with fancy cookies from a Bark Box that we also won! The two dogs shared it with delight! And of course, we know enough not to get too enthralled with the mild temperatures….a little more snow, and a big drop in degrees, resulted in some cold , firm, and crusty hiking conditions. 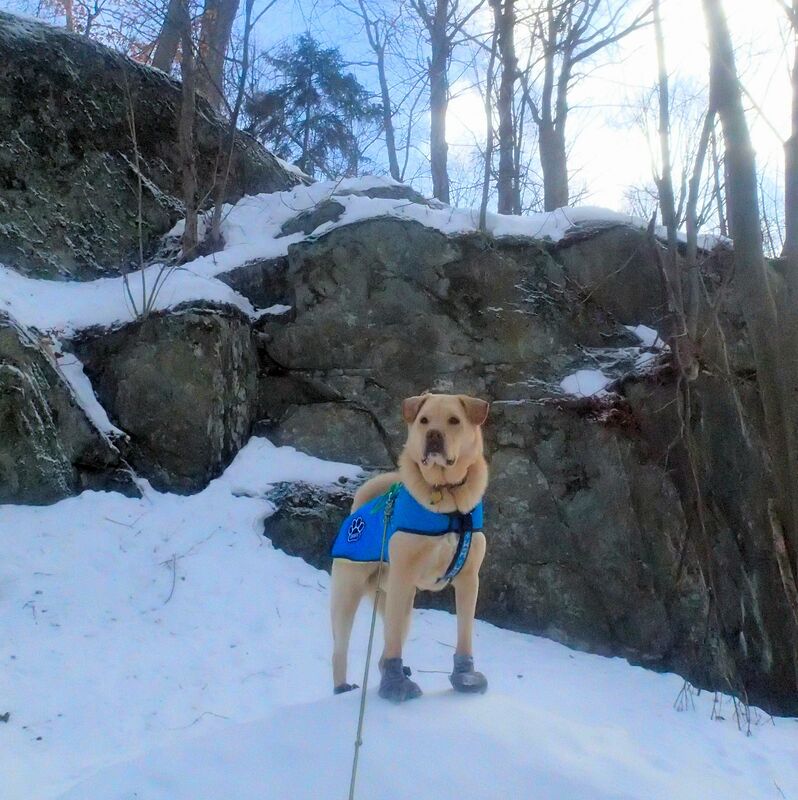 Our dogs’ booties protect them from cold, but also from crusty, uncomfortable snow. 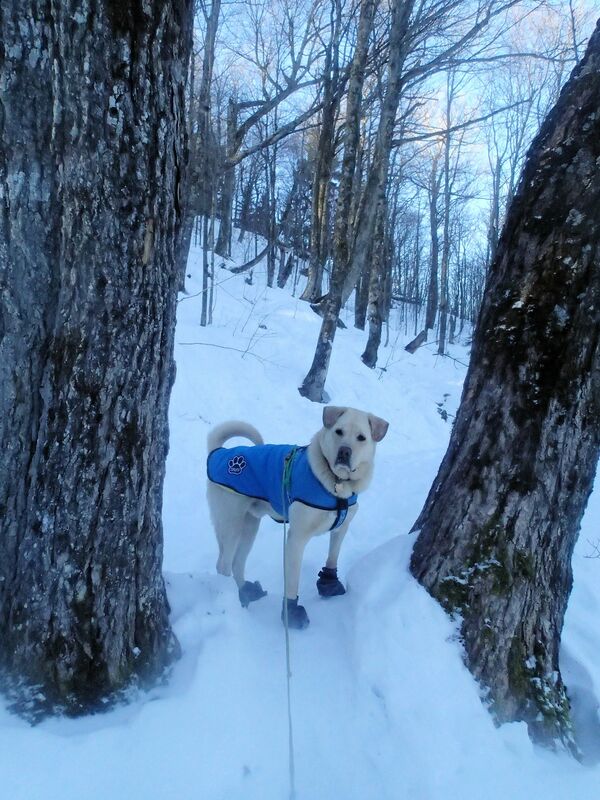 Hiking conditions became tricky on some popular trails…folks who hiked in the deeper snow when it is soft (without snowshoes), left some nice, deep post-holes…those holes were now frozen, and created some hazardous conditions for both dog and human trekkers. We navigated our way around the holes without incident…but it will be nice when we get a good dump of snow to make the trails a bit more enjoyable. Edgar in coat…but no booties. It has to be REALLY cold for him to need the boots! Gryphon has the more sensitive paws…so at about 15 degrees, I’ll put them on him…easier than stopping to add paw wax or put them on mid-trail. 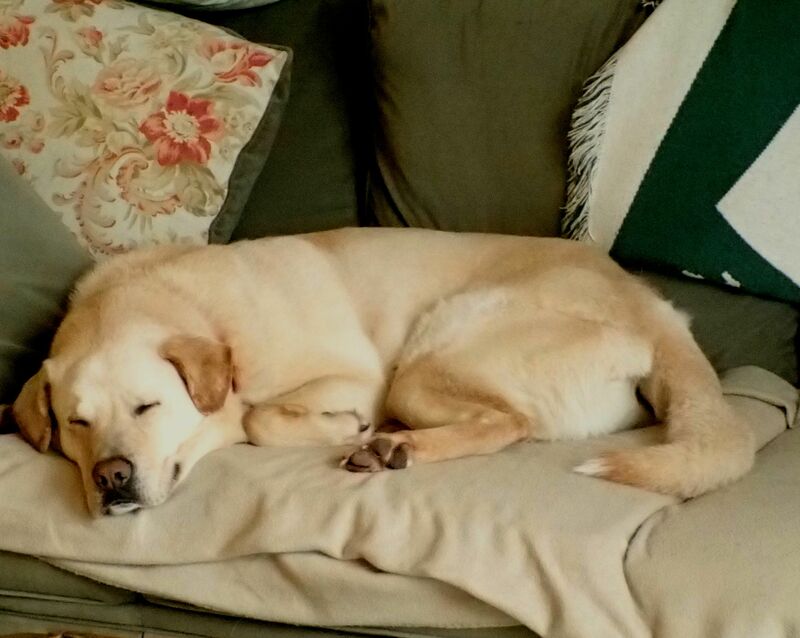 And with a whimper, ( and a very peaceful hike) 2014 enters into the annals of history…. 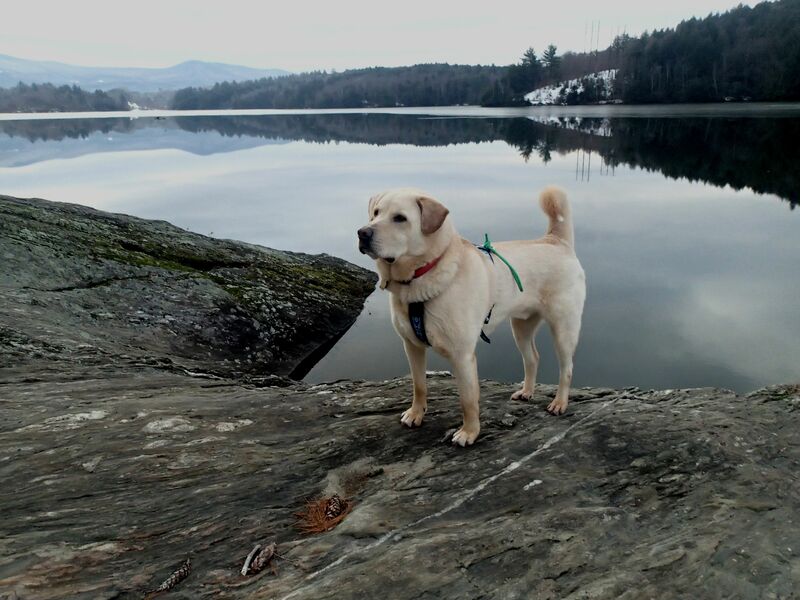 Welcome 2015…and our First Day Hike! 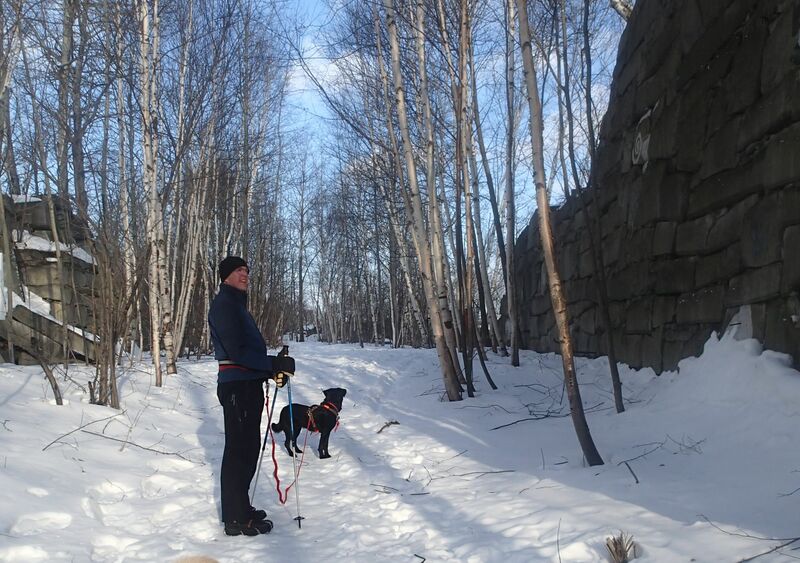 It is cold, but we actually get out when there are a few breaks of sun…we have an entire trail network to ourselves, and it is a dandy! 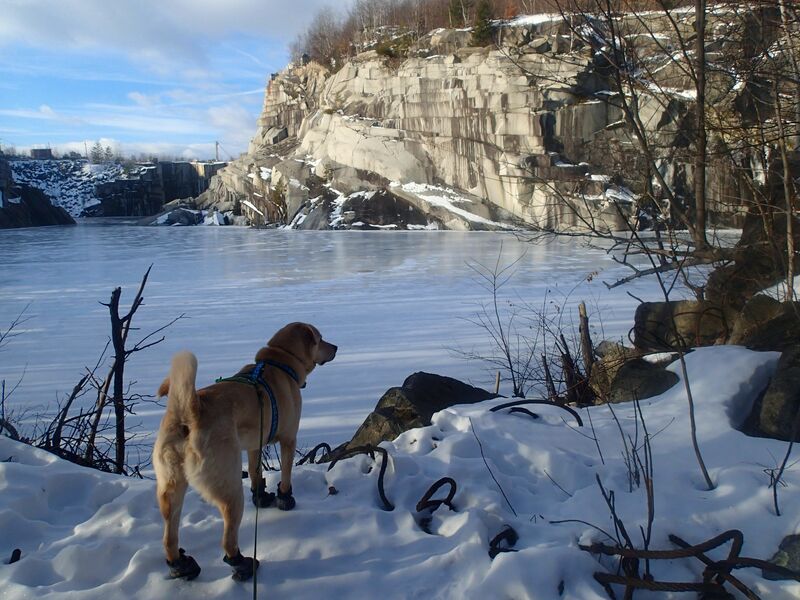 At Millstone Hill Trails, a system of trails meanders around abandoned quarry holes, hills, and relics of the famous Barre granite industry. 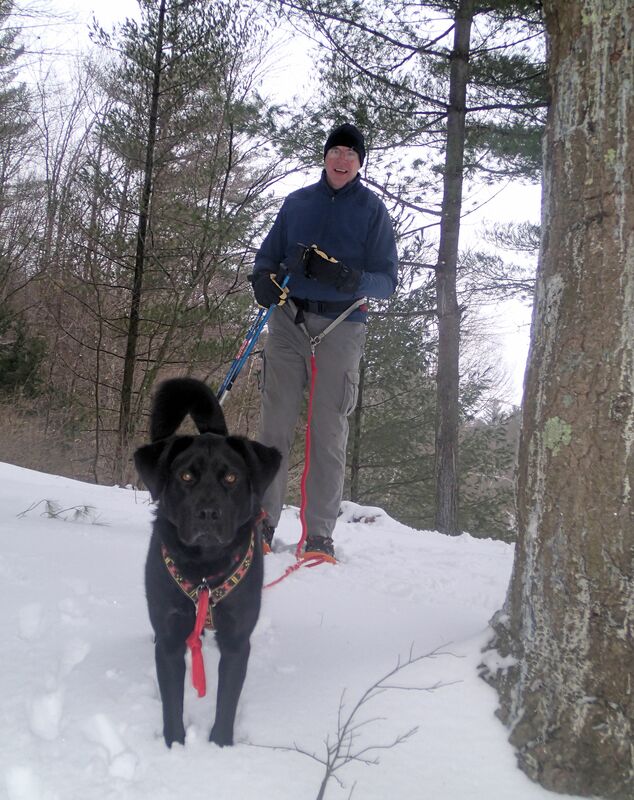 The snow was firm, and untracked…great for microspikes! Best of all, we actually get some of that elusive sunlight when we reach the Grand Lookout….. 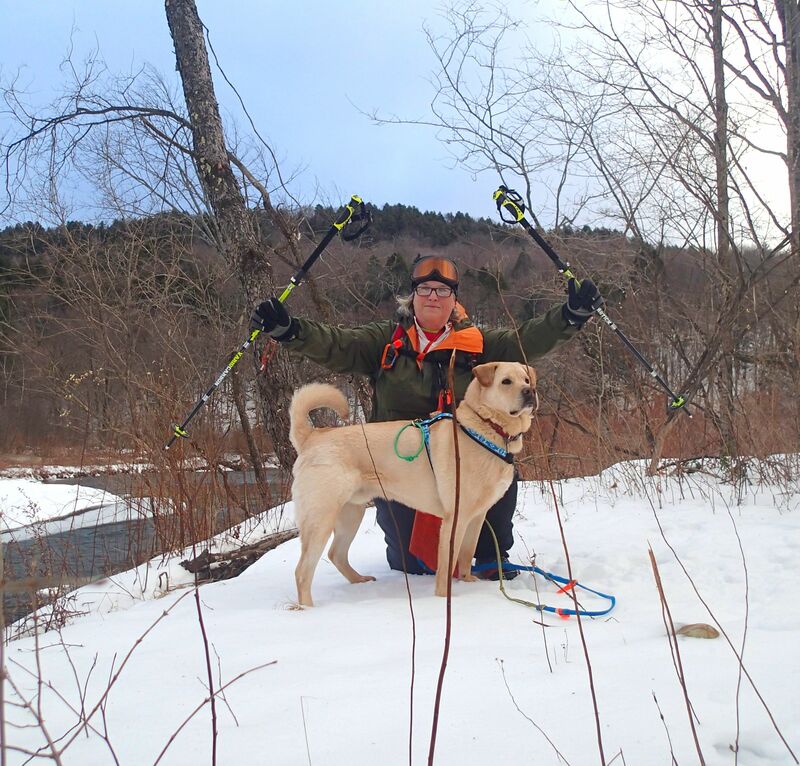 So now we are back into the school, work, daily hike routine….I continue work as a volunteer “Poo Crew” member, monitoring dog waste issues at our nearby Land Trust trail network….and hoping to improve trail conditions for all users! FINALLY, we get to take the new Tubbs Flex Alps snowshoes out for a test trek…we get 5-6 inches of sloppy snow, so we head out to Elephant Rock. A short hike, but it is actually raining a bit, so it seems appropriate. The snowshoes work admirably, on the twisting, narrow, obstacle laden trail. 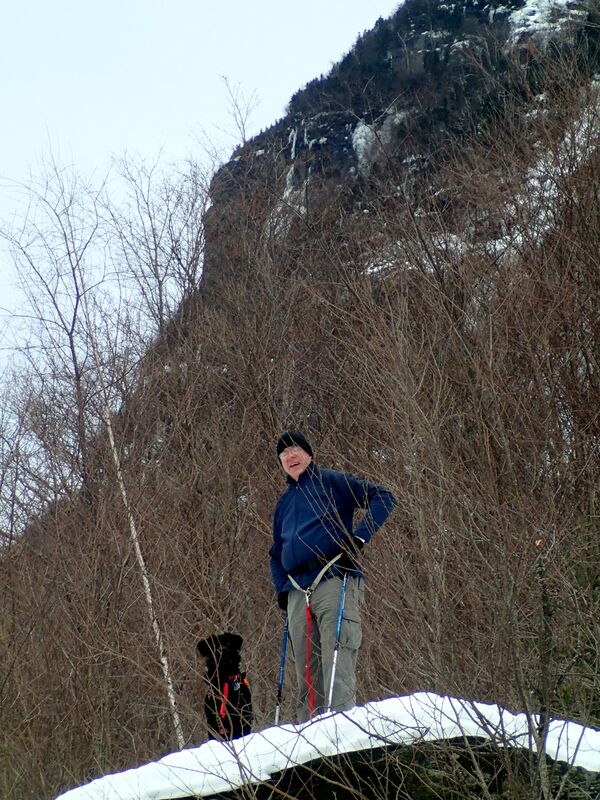 Since there are a few short, but steep climbs, we get to try out the heel-lift…Nice! Definitely a feature that is lacking on our old snowshoes. These were our Christmas presents to each other, and I think we are each quite happy with them! We will see what the rest of January brings…hopefully, more snow suitable for skijoring and kick-sledding, and some longer back-country snowshoe excursions.